Lists like this are always making the rounds. This one may have started with a 2015 book titled “Rules for my Unborn Son.” There are other versions online, but they’re all the same story. Manhood is about wearing sport coats, working the grill, asking the pretty girl out, marrying the woman, playing team sports, and maybe serving in the military. I severed the LinkedIn connection. No harm, no foul – but I don’t go to LinkedIn looking for irritation, and arguing in the comments section has never, even once, changed anybody’s mind. My contact is the regional sales lead for a new company. His job is to open doors, get meetings, develop relationships, and eventually to make sales. For a person in that position, LinkedIn is a marketing tool. This guy is an experienced professional. He knows what he’s doing here, at least at an unconscious level. His list – like this blog post – is signaling to his community about what kind of a person he is and what he expects of the rest of us. No matter the title, this is not about any notional “sons.” Instead, this is how he expects the men in his professional network to act. The message is that my contact is a certain kind of businessman. He has a firm handshake, looks you in the eye, and is an experienced negotiator. You know he’ll close the deal and then you can both go home to your wives and kids. Under the hood, though, the inverse message is also clear: We’re supposed to think less of men who don’t make strong eye contact, who wear nontraditional clothing, who (for whatever reason) don’t marry the girl or work the grill. Those people aren’t up to this guy’s standards. He also keeps a clean hankie on hand in case one of the ladies is overcome with emotion. Good dude, right? Lists like this rise from a nostalgia for a time when gender and relationship roles were supposedly simpler. Men were men, women were women, and there was a well defined and correct way to fill either role. Of course, those roles were radically asymmetric when it came to the workplace. Women were (and are) paid less, under-promoted, subject to outright abuse and subtle neglect, and generally treated like second class human beings. We’re going to be grappling with the fallout of those antique and chauvinist ideas for the rest of our lives. Even worse: The idea that there is a single correct way to experience gender is incredibly toxic. Our society is slowly and haltingly coming to grips with the diversity of human experience – and lists like this, while superficially innocuous, are a step backwards. Things weren’t actually simpler back then. Rather, people who didn’t fit into the dominant patterns either adopted an ill-fitting persona at great emotional and mental cost, or else they were excluded, ostracized, and subject to violence and even questionable medical procedures aimed at correcting them because they were somehow wrong at being themselves. The problem with pushing this as some kind of misty eyed ideal in a professional / business context like LinkedIn should be apparent on the face of it. The thoughtful reader might go back, look at the list, and say that this blog post is a bit of an uptight overreaction. There is no particular word or phrase that stands out as inappropriately crossing some clear line. That’s how this sort of signaling works. The inappropriate stuff emerges gradually as we establish some spaces (the grill, the locker room, perhaps the board room or the industry event) as masculine and therefore subject to different rules. This is the gateway to some really nasty stuff. Once we start down this road, we’re just a fraternity induction and an MBA away from the @GSElevator twitter feed. A few years back, I was invited to speak to a meeting of the US sales and engineering teams of an early stage technology company. I was already a customer, and my team was in the middle of a proof of concept evaluation of their new product. When I arrived, I was struck by the massive gender imbalance. It was an all male event with at least 50 men in attendance. The two women at the conference center were the receptionist who gave me my badge, and the person who served the coffee. The thing had a weird and macho vibe: When the national sales lead finished his presentation, his last slide was a picture of some bird, perhaps a duck, that he had run over on the way to the meeting. The room laughed, some uncomfortably. He left the grisly picture lingering on the projector while he took questions. After my talk, I had an opportunity to meet with the executive team. I asked about the total lack of women at the event, and they laughed and said that they had just been talking about that. I pushed, and they told me that they were working on it, but had to take it slow. Dead-duck guy? He brought in amazing sales numbers. He apparently saw any effort at diversity as diluting his talented team with charity cases and low performers. They didn’t want to alienate him, so they had to tread carefully. I cancelled the proof of concept and insisted that they go only through me for future communications I don’t know what other tricks dead-duck-guy had on offer, but I knew I didn’t want him talking to my team. This particular story has a happy ending. The company did some soul searching and then hired a global head of diversity, who was the most forceful and intersectional person you’ll ever meet. They made a sustained effort to fix their biased and unbalanced team. Dead-duck guy may still be there, but I certainly never saw him around again. Along the way they discovered something really important: Their product had a much larger potential audience than they had realized. The company had been blind to that larger market because so many potential customers had been unwilling to take an initial meeting with dead-duck-guy and his team. They never showed up as qualified prospects. Let me say that again: The macho, hyper-masculine approach of their best sales guy was alienating half of their target audience. The people who didn’t want to deal with him didn’t call back and explain themselves. They just moved on. Maybe they took Rule 23 to heart. Conference season is starting. That means lots of mix-and-mingle events. The goal is relationship building. There will be coffees, breakfasts, lunch-and-learns, bar nights, and boozy steak dinners. There will be private presentations back at the Air B&B, invitations to travel and speak at the national convention, and so on. As these invitations ramp up, my experience is that they move more and more into masculine spaces that exclude women. Once there, we always tend to see a bit more of the old “locker room” banter. It’s a ratchet that goes in only one direction. This happens gradually to avoid anybody getting all weird and uptight when the enticements on offer depart from what we talk about in mixed company. I mean seriously, you know why they put all the big industry events in Las Vegas, right? It’s not for the child care facilities, I can tell you that much. Real talk: I’m pretty nervous about posting this article. I know that my contact will see it – I plan to send him a link (seems only fair). I know at least a few other people who will think I’m talking about them. I feel social pressure against rocking the boat and upsetting anybody. 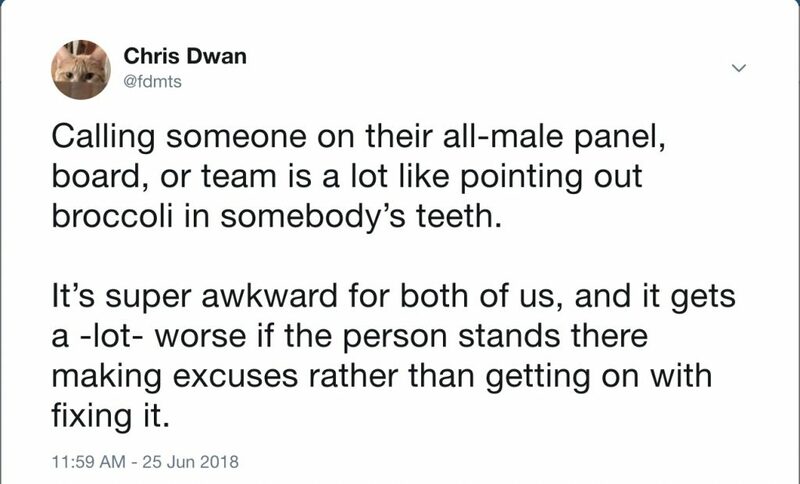 I felt exactly the same way before I spoke up at that all-male team meeting. It’s super stressful go to somebody’s party and tell them that they are doing it wrong. I was the invited speaker. I checked all the boxes of gender, race, and personal presentation to be welcome, and I still very nearly censored myself. The thing that pushed me over the edge, then and now, is that this is the same pressure that keeps women silent in the face of uncounted insults and indignities. It gave me just the briefest glimpse of what it’s like to be on the unpleasant side of social pressure to conform, stay quiet, and obey. That brief glimpse was enough to motivate me to speak up then, and it continues to do so today. As the saying goes: If you see something, say something. Let me start off by agreeing that yes, the network is slow. I’ve moved a fair amount of data over the years. Even when it’s only a terabyte or two, the network always seems uncomfortably slow. We never seem to get the performance we sketched out on the whiteboard, so the data transfer takes way longer than expected. The conversation quickly turns to the question of blame, and the blame falls on the network. No disagreement there. Allow me to repeat: Yes, the network is slow. This post is the first in a series where I will share a few simple tools and techniques to unpack and quantify that slowness and get things moving. Sometimes, hear me out, it’s not the entire network that’s slow – it’s that damn USB disk you have plugged into your laptop, connected over the guest wi-fi at Panera, and sprayed across half a continent by a helpful corporate VPN. My point here is not to show you one crazy old trick that will let you move petabytes at line-rate. Rather, I’m hoping to inspire curiosity. Slow networks are made out of fast and slow pieces. If you can identify and remove the slowest link, that slow connection might spring to life. This post is about old-school, low-level Unix/Linux admin stuff. There is nothing new or novel here. In fact, I’m sure that it’s been written a bunch of times before. I have tried to strike a balance to make an accessible read for the average command line user, while acknowledging a few of the more subtle complexities for the pros in the audience. Spoiler alert: I’m not even going to get to the network in this post. This first one is entirely consumed with slinging data around inside my laptop. When you get deep enough into the guts of Linux, everything winds up looking like a file. Wander into directories like /dev or /proc, and you will find files that have some truly weird and wonderful properties. The two special files I’m interested in today both live in the directory /dev. They are named “null” and “zero”. /dev/null is the garbage disposal of Linux. It silently absorbs whatever is written to it, and never gives anything back. You can’t even read from it! /dev/zero is the opposite. It emits an endless stream of binary zeroes. It screams endlessly, but only when you are listening. This does a whole lot of nothing, creating and throwing away zeroes just as fast as one of the processors on my laptop can do it. Below, you can see that my “cat” process is taking up 99.7% of a CPU – which makes it the busiest thing on my system this morning. Which, for me, raises the question: How fast am I throwing away data? If my laptop, or any other Linux machine, is going to be involved in a data transfer, then the maximum rate at which I can pass data across the CPU matters a lot. My ‘cat’ process above looks pretty efficient from the outside, with that 99.7% CPU utilization, but I find myself curious to know exactly how fast that useless, repetitive data is flowing down the drain. For this we need to introduce a very old tool indeed: ‘dd’. When I was an undergraduate, I worked with a team in university IT responsible for data backups. We used dd, along with a few other low level tools, to write byte-level images of disks to tape. dd is a simple tool – it takes data from an input (specified with “if=”) and sends it to an output (specified with “of=”). The command below reads data from /dev/zero and sends it to /dev/null, just like my “cat” example above. I’ve set it up to write a little over a million 1kb blocks, which works out to exactly a gigabyte of zeroes. On my laptop, that takes about 2 seconds, for a throughput of something like half a GB/sec. The same command, run on the cloud server hosting this website, finishes in a little under one second. Some of this difference can be attributed to CPU clock speed. My laptop runs at 1.8GHz, while the cloud server runs at 2.4GHz. There are also differences in the speed of the system memory. There may be interference from other tasks taking up time on each machine. Finally, the system architecture has layers of cache and acceleration tuned for various purposes. My point here is not to optimize the velocity of wasted CPU cycles, but to inspire a bit of curiosity. While premature optimization is always a risk – I will happily take a couple of factors of two in performance by thinking through the problem ahead of time. As an aside, you can find out tons of useful stuff about your Linux machine by poking around in the /proc directory. Look, but don’t touch. Notice that it took almost four times as long to write those zeroes to an actual file instead of hurling them into /dev/null. At a gut level, this makes sense. It kinda-sorta ought-to take longer to write something down than to read it back. The caches involved in both reading and writing mean we may see different results if we re-run these commands over and over. Personally, I love interrogating the behavior of a system to see if I can predict and understand the way that performance changes based on my understanding of the architecture. I know, you were hoping to just move data around at speed over this terribly slow network. Here I am prattling on about caches and CPUs and RAM and so on. As I said above, my point here is not to provide answers but to provoke questions. Agreed that the network is slow – but perhaps there is some part of the network that is most to blame. That’s enough for one post. In the next installment, I will show a few examples of one of my all time favorite tools: iperf. 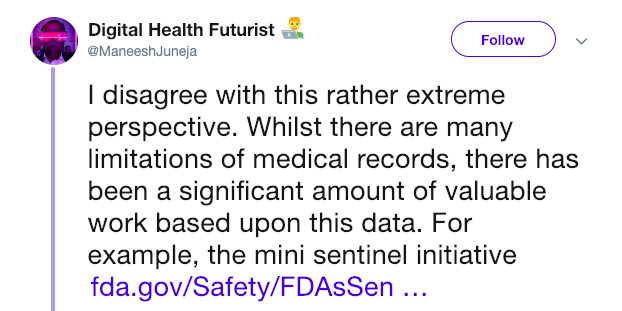 It can be hard for non-biologists, particularly tech/math/algorithm/data science/machine learning/AI folks, to really internalize the level of weirdness and uncertainty encoded in biological data. It is not, contrary to what you have read, anything like the software you’ve worked with in the past. More on that later. This post is a call for humility among my fellow math / computer science / programmer type people. Relax, roll with it, listen first, come up to speed. Have a coffee with a biologist before yammering about how you’re the first smart person to arrive in their field. You’ll learn something. You’ll also save everybody a bit of time cleaning up your mess. Don’t be the person who walks into a research group meeting carrying a half read copy of “Genome” by Matt Ridley, spouting off about how all you need is to get TensorFlow running on some cloud instances under Lambda and you’re gonna cure cancer. This is not to speak ill of “Genome,” it’s a great book, and I’m super glad that lots of people have read it – but it no more qualifies you to do the heavy lifting of genomic biology than Lisa Randall’s popular press books prepare you for the mathematical work of quantum physics. You’ll get more cred with a humble attitude and a well thumbed copy of “Life Ascending” by Nick Lane. For full points, keep Horace Judson’s “The Eighth Day of Creation” on the shelf. Mine rests between Brooks’ “The Mythical Man Month” and “Personality” by Daniel Nettle. Back in 2001, the human genome project was wrapping up. One of the big questions of the day was how many genes we would find in the completed genome. First, set aside the important but fundamentally un-answerable question of what, exactly, constitutes a gene. Taking a simplistic and uncontroversial definition, I recall a plurality of well informed people who put the expected total between 100,000 and 200,000. The answer? Maybe a third to a sixth of that. The private sector effort, published in Science, reported an optimistically specific 26,588 genes. The public effort, published in Nature, reported a satisfyingly broad 30,000 to 40,000. There was a collective “huh,” followed by the sound of hundreds of computational biologists making strong coffee. This happens all the time in Biology. We finally get enough data to know that we’ve been holding the old data upside down and backwards. The fundamental dogma of information flow from DNA to RNA to Protein seems brittle and stodgy when confronted with retroviruses, and honestly a bit quaint in the days of CRISPR. I’ve lost count of the number of lower-case modifiers we have to put on the supposedly inert “messenger molecule” RNA to indicate its various regulatory or even directly bio-active roles in the cell. Biologists with a few years under their belt are used to taking every observation and dataset with a grain of salt, to constantly going back to basics, and to sighing and making still more coffee when some respected colleague points out that that thing … well … it’s different than we expected. So no, you’re not going to “cure cancer” by being the first smart person to try applying math to Biology. But you -do- have an opportunity to join a very long line of well meaning smart people who wasted a bunch of time finding subtle patterns in our misunderstandings rather than doing the work of biology, which is to interrogate the underlying systems themselves. My first exposure to bioinformatics was via a seminar series at the University of Michigan in the late 90’s. Up to that point, I had studied mostly computer science and artificial intelligence. I was used to working with human-designed systems. While these systems sometimes exhibited unexpected and downright odd behaviors, it was safe to assume that a plan had, at some point, existed. Some human or group of humans had put the pieces of the system together in a way that made sense to them. To my eye, gene expression pathways look contrived. It’s all a bit Rube Goldberg down there, with complex and interlocking networks of promotion and inhibition between things with simple names derived from the names of famous professors (and their pets). My design sensibilities keep wanting to point out that there is no way that this mess is how we work, that this thing needs a solid refactor, and that … dammit … where’s the coffee? It gets worse when you move from example to example and keep finding that these systems overlap and repeat in the most maddening way. It’s like the very worst sort of spaghetti code, where some crazy global variable serves as the index for a whole bunch of loops in semi-independent pieces of the system, all running in parallel, with an imperfect copy paste as the fundamental unit of editing. This is what happens when we apply engineering principles to understanding a system that was never engineered in the first place. Those of us who trained up on human designed systems apply those same subconscious biases that show us a face in the shadows of the moon. We’re frustrated when the underlying model is not based on noses and eyes but rather craters and ridges. We go deep on the latest algorithm or compute system – thinking that surely there’s reason and order and logic if only we dig deep enough. They also laugh, stay humble, and drink lots of coffee. 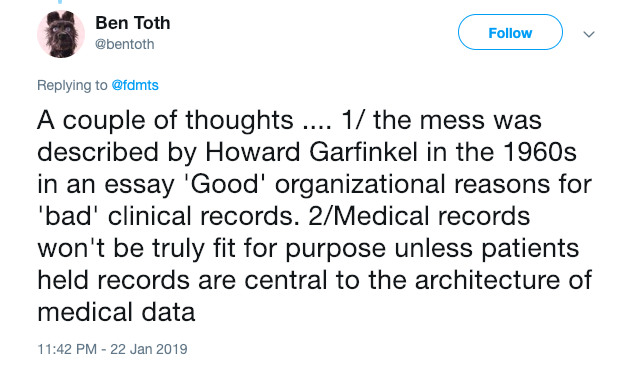 In my previous blog post, I talked about the fact that medical records are a dumpster fire from a scientific data perspective. Apparently this resonated for people. This post begins to sketch some ideas for how we might start to correct the problem at its root. Lots of people have thought deeply about this stuff. One specific example is the Apperta Foundation whose white paper makes a wonderful introduction to the topic. @bentoth’s second point, above, is exactly correct. Until we put the patient at the center of the medical records system, we’re going to be digging in the trash. The question is how we get from here to there. It’s true: Even given the current abysmal state of things, researchers are still making important discoveries. This indicates to me that it will be well worth our while to put some time and effort into improving things at the source. If we can get value out of what we’ve got now, imagine the benefits to cleaning it up! Who Speaks for the Data? One of the first steps towards better data, in any organization, is to identify the human beings whose job is, like the Lorax, “speak for the data.” Identifying, hiring, and radically empowering these folks is a recommendation that I make to many of my clients. If you tell me that you have “data janitors,” I know that you consider your data to be trash. Beyond that, I also know that you consider curation, normalization, and data integration to be low-respect work that happens after hours and is not part of the core business mission. It’s not a big jump from there to realize that the structures and incentives feeding the problem aren’t going to change. Instead, you’re just going to hire people to pick through the trash and stack up whatever recyclables they can find. I’ve even heard people talk about hiring a “data monkey.” Really, seriously, just don’t do that, even in casual conversation. It’s not cool. It takes a huge amount of work to capture primary observations, and still more effort to connect them to the critical context in which they were created. Good metadata is what allows future users to slice, dice, and confidently use datasets that they did not personally create. Then there is the sustained work of keeping data sets coherent. Institutional knowledge and assumptions change and practices drift over time. Even though files themselves may not be corrupted, data always seems to rot unless someone is tending it. This work cannot simply be layered on as yet another task for the care team. Physicians and nurses are already overwhelmed and overworked. Adding another layer of responsibility and paperwork to their already insane schedules will not work. We need to find a resource that already exists, that scales naturally with the problem, and who also has a strong self-interest in getting things right. Fortunately, such a resource exists: We need to leverage patients and their families. 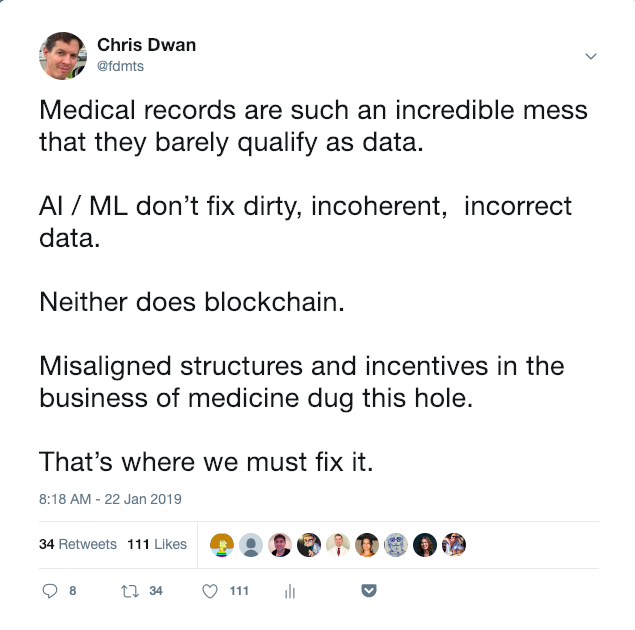 We need to empower them to curate and annotate their own medical records, and we need to do it in a scalable and transparent way. 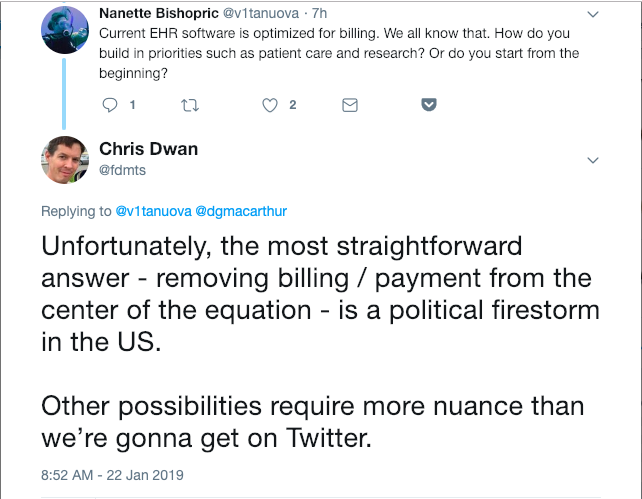 I’m willing to bet that if we start there, we’ll wind up with a population who are more than happy, for the most part, to share slices of their data because of the prospective benefits to people other than themselves. Health systems don’t encourage it, but patients can and do demand access to the data derived from their own bodies. People suffering from rare or undiagnosed diseases make heavy use of this fact. They self-organize, using services like Patients Like Me or Seqster to carry their own information back and forth between the data silos built by their various providers and caregivers. Similarly, physicians can work with services like the Matchmaker Exchange to find clues in the work of colleagues around the world. Unfortunately, there is no easy way for this cleaned and organized version of the data to get back into the EMR from which it came. That’s the link to be closed here – people are already enthusiastically doing the work of cleaning this data. They are doing it on their own time and at their own expense because the self-interest is so clear. The job of the Data Lorax is to find a way to close that loop and bring cleaned data back into the EMR. This is different from what we do today, so we’re going to need to adapt a lot of systems and processes, and even a law or a rule here or there. Fortunately, it’s in everybody’s interest to make the change. My former colleagues at the Broad Institute recently published a marvelous case study. They describe, in a delightfully brisk and jargon-free way, some of the process improvements they used to radically increase the productivity of the genome sequencing pipeline. This post is about bringing the benefits of their thinking to our high performance computing (HPC) systems. The fundamental change was to modify the pipeline of work so that instead of each stage “pushing” to the next, stations would “pull” work when they were ready to receive it. This should be familiar to folks who have experience with Kanban. It also overlaps with both Lean and Agile management techniques. My favorite part of the paper is that they applied similar techniques to knowledge work – with similar gains. The spare text of the manuscript really doesn’t do justice to what we called the “strategy board meeting.” By the time I started attending in 2014 it was a massive thing, with fifty to a hundred people gathering every Wednesday morning. It was standing room only in front of a huge floor-to-ceiling whiteboard covered with brightly colored tape, dry erase writing, and post-it notes. Many of the post-it notes had smaller stickers stuck on them! Somehow, in an hour or less every week, we would manage to touch on every part of the operation – from blockers in the production pipeline through to experimental R&D. My favorite part was that it was a living experiment. Some weeks we would arrive to find that the leadership team had completely re-jiggered some part of the board – or the entire thing. They would explain what they were trying to do and how they hoped we would use it, and then we would all give it a try together. I really can’t explain better than the paper itself. It’s 100% worth the read. 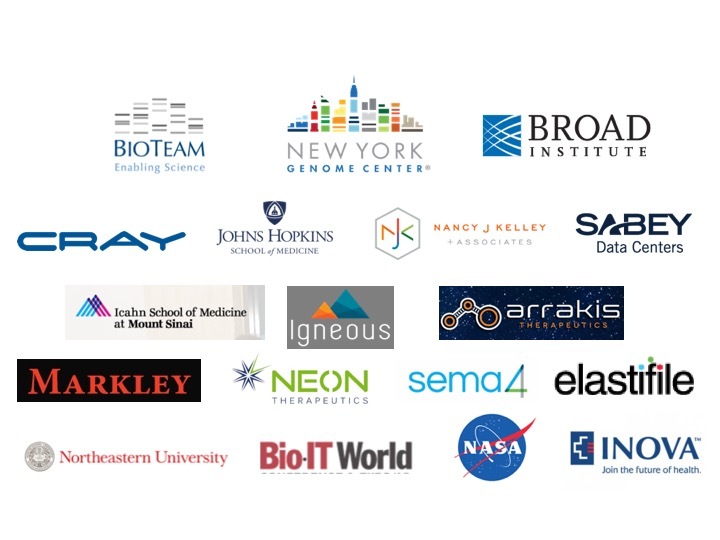 When I started attending those strategy board meetings in 2014, I was responsible for research computing. This included, among other things, the HPC systems that we used to turn the raw “reads” of DNA sequence into finished data products. This was prior to Broad’s shift to Google’s Cloud Platform, so all of this happened on a large but finite number of computers at a data center in downtown Boston. At that time, “pull” had not really made its way into the computational side of the house. Once the sequencers finished writing their output files to disk, a series of automatic processes would submit jobs onto the compute cluster. It was a classic “push,” with the potential for a nearly infinite queue of Work In Progress. Classical thinking is that healthy queue is a good thing in HPC. It gives the scheduler lots of jobs to choose from, which means that you can keep utilization high. In this case, it blew up pretty badly. At the time, there were three major steps in the genome analysis pipeline: Base calling, alignment, and variant calling. In the summer of 2015, we accumulated enough jobs in the middle stage of the pipeline (alignment) that some jobs were waiting a really long time to run. This meant that they amassed massive amounts of extra priority in the scheduler. This extra priority was enough to put them in front of all of the jobs from the final stage of the pipeline. We had enough work in the middle of the pipeline, that the final stage ran occasionally, if at all. Unfortunately, it didn’t all tip over and catch fire at once. The pipeline was in a condition from which it was not going to recover without significant intervention, but it would still emit a sample from time to time. As the paper describes, we were able to expedite particular critical samples – but that only made things worse. Not only did it increase the wait for the long-suffering jobs in the middle of the pipeline, but it also distracted the team with urgent but ultimately disruptive and non-strategic work. One critical realization was that in order for things to work, the HPC team needed to understand the genomic production pipeline. From a system administration perspective, we had high utilization on the system, jobs were finishing, and so on. It was all too easy to push off complaints about slow turnaround time on samples as just more unreasonable demands from an insatiable community of power-users. Once we all got in front of the same board and saw ourselves as part of the same large production pipeline, things started to click. Once we knew what was going on, it was clear that we had to drain that backlog before things were going to get better. It was a hard decision because it meant that we had to make an explicit choice to deliberately slow input from the sequencers. We also had to choose to rate-limit output from variant calling. Once we adopted a practice of titrating work into the system only at sustainable levels, we were able to begin to call our shots. We measured performance, made predictions, hit those predictions, fixed problems that had been previously invisible, and added compute and storage resources as appropriate. It took months to finish digging out of that backlog, and I think that we all learned a lot along the way. All of this also gave real energy to Broad’s push to use Google’s cloud for compute and data storage. That has been transformational on a number of fronts, since it turns a hardware constraint into a money constraint. Once we were cloud-based we could choose to buy our way out of a backlog, which is vastly more palatable than telling world-leading scientists to wait months for their data. Seriously, if your organization is made out of human beings, read their paper. It’s worth your time, even if you’re in HPC. I’ve spent most of my career on the uncomfortable edge of technology. This meant that I was often the one who got to deal with gear that was being pushed into production just a little bit too early, just a little bit too fast, and just a little bit too aggressively for everything to go smoothly. This has left me more than a little bit jaded on marketing hype. I got direct messages from serious sounding people asking if there was still time to get in early on funding me. It's easy to get distracted and confused by the hype that surrounds new computing and data storage technologies. This talk will offer working definitions and brutally practical assessments of the maturity of all of the buzzwords in the title. Somewhat to my horror, they accepted it. Here are the slides. I would love to hear your thoughts.